Rotork CVA failsafe electric process valve actuators have been selected for a critical flow control application in the Australian coal mining industry. Salcan Process Technology manufactures wellhead skids designed for coal mine degassing duties. The remotely sited skids are used in conjunction with Salcan’s control and telemetry systems to enable methane and other flammable gases to be extracted from underground coal seams prior to the commencement of mining operations. Salcan Director Vincent Cantwell explains: “The Rotork actuated control valve allows us to control the flow of gas while maintaining back pressure in the coal seam. Bluetooth technology embedded in a failsafe electric positioner package eliminates the need to enter the hazardous area surrounding the valve for set up and diagnostic functions. 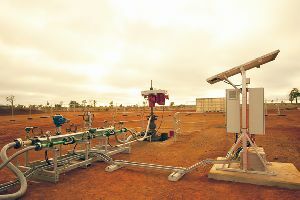 The successful use of Rotork CVA actuators for similar duties at thousands of remote sites on the Queensland LNG project has made an important contribution to the selection decision by Salcan. The CVA delivers continuous, repeatable modulating control with a programmable fail to position option. Resolution, repeatability and hysteresis performance is quoted at less than 0.1% of full scale, offering suitability for the most demanding control valve applications, whilst low power consumption enables operation from renewable power sources such as solar panels. Find out more about CVA range actuators. Photograph reproduced with kind permission from Salcan Process Technology.